Gray wolves are social creatures that live in packs, with each member responsible for helping with the care and upbringing of their young. The pack includes one dominant male and female, their previous year’s offspring and several adult wolves that may or may not be related to the alpha breeding pair. Packs, as in many families, will gather their resources to help raise new pups. A female is ready to begin breeding when she is 2 years old. She must dig out a nest in the back of her den to prepare for the birth of her pups. The female will occasionally choose an established structure, such as an abandoned beaver lodge, an open log or a cave to deliver and rear her litter. The alpha female in the pack will whelp an average of 6-10 pups per litter each spring. Blind and deaf, the pups are completely helpless at birth. The female will stay with the pups for the first few weeks to care for them. For the first 45 days the mother wolf nurses her pups. She will also provide them with regurgitated food as they learn to eat meat. Pack members bring food for the mother to eat so she can concentrate on caring for her litter without needing to leave to hunt. Other members of the pack will also regurgitate food for the pups to facilitate the social order and bonding process within the pack. Pups jump at adult wolves’ faces and bite at their muzzles to encourage the regurgitation. The primary component of a wolf’s diet is meat from various animals, including elk, deer, caribou, moose, beavers and rabbits. At about five weeks, the mother weans her pups so they can begin eating meat on their own. After weaning, the mother will carry her pups above ground to rendezvous sites where they will play on their own. The pups will play together and learn to hunt insects and small rodents. When they are 4 months old, after teeth are completely developed, the young pups will begin hunting with the pack. The mother will continue to bring her pups to rendezvous sites until they are regularly hunting with the adults. By the time the pups are 5-6 months old they roam about 2-3 miles away from the rendezvous sites. They gradually stop using the rendezvous site and begin following the adults in the pack. The pups require very little care at this point. 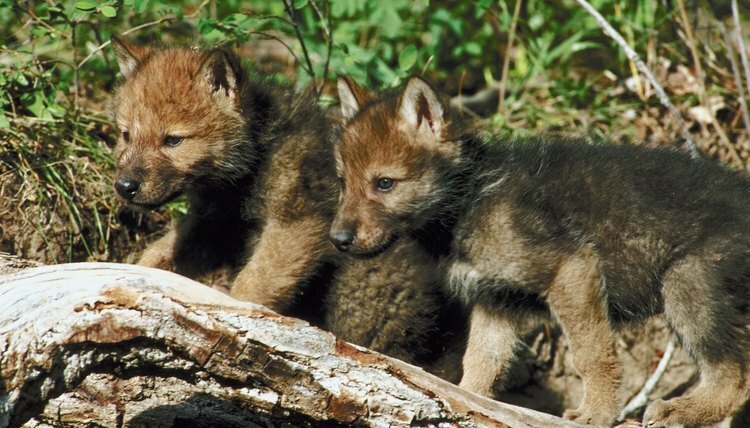 Many pups will leave the pack to find their own territory by age 2.